Probably about 5 years ago if you entered my bedroom you would have seen a Windows 2000 machine with Microsoft Office and Internet Explorer on it. Then I moved to Mac and started using Microsoft Office .mac, Safari and iTunes. Increasingly though I'm turning to Open Source software to use on a day to day basis. I enjoy programming, but having the source code is not really the key; the key to me is that the data generated with OSS is generally far more open than proprietary software. I use OpenOffice.org on X11 on my iBook for uni work, and I love the open document formats, and I use Camino now instead of Safari (I know Camino is Mac only, but it still uses the Mozilla core and the bookmark files etc are open). This brings me to iTunes. Waaaay back when I got version 1 of iTunes to tinker around with on my old blueberry iMac I was very impressed with the user interface. Coming from the Windows world I was used to WinAmp, which is fine for a few songs but for mountains of tracks the interface is horrendus. Windows Media Player was equally bad, and iTunes seemed to just be so simple: playlists on one side, tracks on the other. If you're in the know with music software you probaly know about this already, but looking at it now I think it holds a lot of promise. 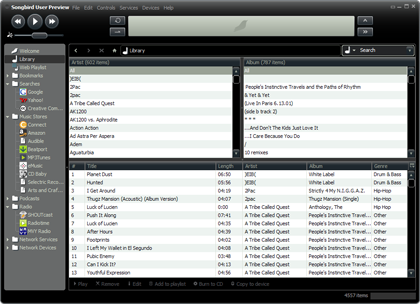 The interface uses the Firefox engine, so it will look almost the same on any platform, and so far it supports MPA, MP3, AAC, OGG, FLAC, WMA (yuk) and more… finally I can convert all my songs to Ogg Vorbis and have a player that supports them natively. At the moment the software is only for Windows, and I have a restraining order against Windows, but Mac OS X and Linux versions will be out soon. Because it uses the Firefox rendering engine, does this mean I'll be able to run it on whatever WM I want? XFce with Songbird, Thunderbird, Flock and OpenOffice would be a very compelling stack. Of course it would be on DragonFlyBSD with Linux binary emulation ;).